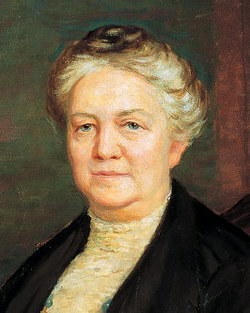 Clarissa S. Williams was the sixth General Relief Society President for The Church of Jesus Christ of Latter-day Saints. Members of this church are sometimes nicknamed Mormons. The General Relief Society president oversees the world-wide women’s auxiliary for the Church. Clarissa S. Williams was born on April 21, 1859, to Susan Elizabeth West and George A. Smith. She was best friends with some of Brigham Young’s daughters as she was growing up, which allowed her to meet many people who would be influential in her later life. She graduated from what is now the University of Utah with a teaching certificate and opened a private school, because she strongly believed education, particularly for women, was essential for a successful adult life. She married William Newjent Williams one day before he left on a mission. (In the past, the Church of Jesus Christ sent married men on missions without their wives, although this is not done today.) She taught school during the two years he was gone. She became the sixth General Relief Society President in 1921 at a critical time in the history of the United States, where she lived, because women had just received the right to vote. This opened up many new opportunities for women, and Clarissa took advantage of the changing views on women in her leadership. The Church of Jesus Christ had just initiated a new program called The Relief Society Social Service Project, which Clarissa oversaw during her tenure. It was a program of daunting scale that worked to help those in need world-wide. One roles of the program was to help women find good employment so they could support or help support their families. They also ran an adoption agency. To better cope with the results of the war (World War I), they maintained a warehouse filled with food, clothing, and other supplies. Some were sent to Europe, which was struggling with the impact of World War I. Other supplies were used to help those in need locally. They held health clinics and trained people in running non-profits. They also ran training courses in a variety of other areas, including health, nutrition, crime prevention, and economic conditions. They also provided scholarships to upper-division women. In addition, she instituted professional accounting methods to manage the funds of the Relief Society. In 1922, a study showed that 751 infants and 58 mothers had died as a result of pregnancy or childbirth that year. Clarissa initiated a program to bring down those numbers. The Relief Society had sold the wheat they raised and stored to the U.S. government during the war, and they used the funds for this new initiative. The Relief Society organizations around the world developed programs that suited their local needs, including creating kits that could be delivered to the homes of pregnant women, and starting hospitals. In 1924, church leaders found the program had saved 500 lives. She said the work the Relief Society did was possible because when Joseph Smith first organized the Relief Society, he placed great trust in the ability of women to do great things. Her work in developing these programs set the foundation for the welfare and humanitarian aid programs the LDS Church operates today world-wide. This page was last edited on 19 December 2013, at 11:09.